← Elderly A and E ? When is a cateract not a cateract ? The answer is when it is in the NHS. Cateract surgery is the most common procedure carried out in the NHS. The operation is not hugely expensive and can be life changing for many patients, most of whom are elderly. 300,000 operations are done each year, so it should be a good news storey all round. Sadly that is not the case for many people. 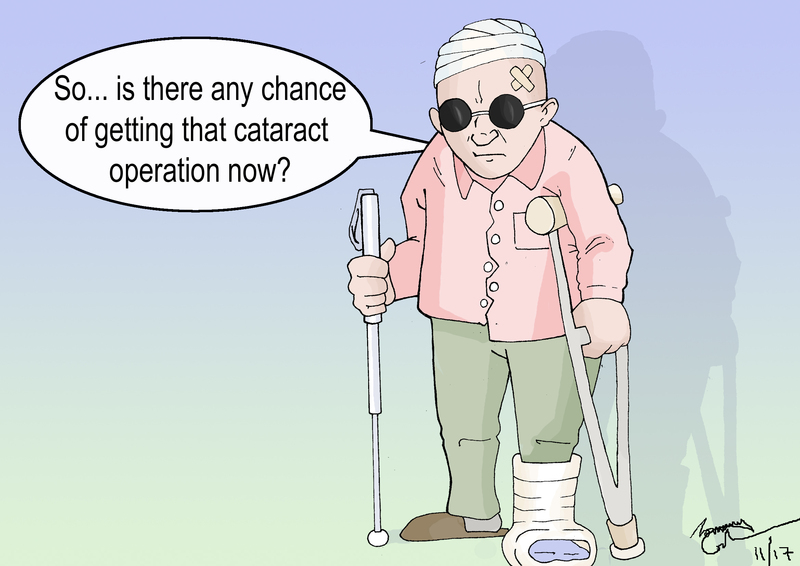 Budget constraints mean that you have to be almost blind before you qualify for the operation. A recent study showed that the condition which can severely impair a person’s vision, preventing people from carrying out daily tasks such as driving or going to the shops. It can also lead to more falls which costs the NHS a lot more money to repair broken bones. Not to mention the fact that if you have cateracts you are 40% more likely to die early if you don’t have the surgery. If prevention is better than cure, you might think the NHS would be racing to do more operations. After it would enable older people to remain independent for longer; it would save money on falls treatment. It would be a vote winner amongst older people. But NHS think differently, they start from the fact that there is no money. Even if there was more money they might want to spend it on something else. And anyway there are not enough ophthalmic surgeons. And keeping older people alive for longer may cost the NHS more money still. And those who can afford it can always get it done privately. Just cough up £3,000 per eye but look out for the buy one get one free offers first. With can’t do attitudes like this, it is no wonder that old people are at the back of the NHS queue. This entry was posted in HEALTH, N.H.S.. Bookmark the permalink. I can hear you, however your visions and dreams are clear as a mountain stream. When you mention money and the politicians, government and the NHS, my dreams become very blurred, and I trust I am not having my. Visions dashed? ?